In 1992, The National Resource Center for Adoption (NRCA) published “Building a Model Adoption Program,” detailing components to help child welfare systems build an effective adoption program. The Model focused on three fundamental concepts:A comprehensive continuum of community-based services for all adoption parties is essential to build an effective model program. >Adoption is a life-long process, and adoptive families should feel comfortable accessing services when development or adoption issues emerge that cause them stress. Involvement of communities, agencies, and individuals in key adoption decisions improves adoption programs and practices.Twenty-two years later these concepts still hold true. The past decade has seen drastic changes in the adoption arena with movement away from “closed” adoptions and a general recognition that inclusion of birth families benefits all parties. Child welfare systems nationwide acknowledge that adoption is a life-long process and realize their responsibility to ensure services and supports are in place for families post permanency. Many relatives want to become permanent resources for their kin, resulting in changes in practice and an increase in the number of children who obtain permanency with their kin. 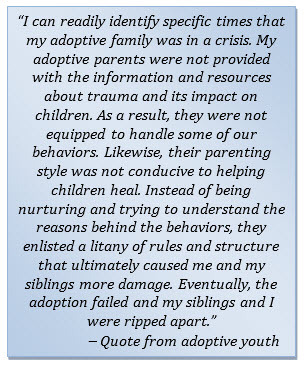 Expanding knowledge about trauma and its short- and long-term impact on abused and neglected children has resulted in changes to foster/adoptive parents’ role in helping children “heal” and advances in the training, preparation and services that systems provide. Despite these changes, there is still a need for child welfare agencies to enhance their systems to include comprehensive continuums of care that prepare, support and encourage permanency from entry to exit. NRCA has developed a Permanency Support and Preservation Model that provides a framework for practice related to permanency services and embodies a solution-focused approach concentrating on prevention. The Model’s components are designed to bolster permanency and decrease disruption and dissolution of adoptions and guardianships. Guiding principles: The philosophical orientation and organizational values for the Model. The principles are the foundation from which the Model is built. Framework for Developing a Continuum of Sustainable Permanency-Focused Services: An approach for developing a system focused on permanency that integrates individual, organizational and community-based inputs. The framework provides the structure and pillars for the Model. 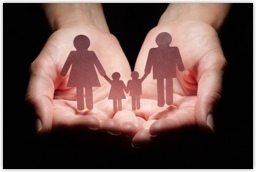 Path to Positive Adoption/Guardianship Outcomes: Tip sheets that provide practical information on some of the fundamental components that need to be embedded in child welfare systems to successfully achieve outcomes. Why should states consider a new model? Public child welfare agencies have a level of responsibility for children post permanency. The Information Memorandum issued by Administration for Children and Families on 5/30/14 states, “We (ACF) encourage states to develop and provide a continuum of post-adoption services for adoptive families, both domestic and international.” This responsibility is heightened by the sheer number of children on the post-permanency side versus those in care. 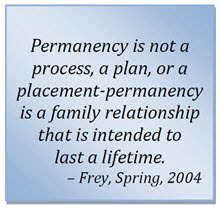 States need to develop meaningful and long-term strategies that result in effective permanency support and preservation services. Nationwide, states are seeking ways to refine their permanency support and preservation services to ensure that children are kept safe and are growing up in permanent homes that enhance their well-being. With limited resources and compounding stressors, child welfare systems must identify effective ways to alter practice and programs that promote permanency outcomes. The NRCA Model provides states with a framework that enhances their ability to identify needs and trends, coordinate community efforts, leverage existing resources, and create a continuum of care, including a coherent, coordinated set of services that are planned, managed and delivered to adoptive/guardianship families before, during and after finalization. A range of organizations will provide these services, and a multitude of cross-disciplinary professionals and informal caregivers will perform them. The Model serves as a guide for implementing a prevention- and solution-focused approach to post permanency. States can use it to assess their own systems and to identify opportunities for refinement and innovation so they provide a robust continuum of permanency support and preservation services. An assessment that highlights components needed for the development of an adaptive and coordinated system of resources, communication, civic engagement and advocacy for a meaningful preservation program. STTs can complete the assessment to determine where they can enhance their system of care through increased community engagement/partnership. A document that provides an overview of the need for a systems approach in providing post- permanency services as well as more in-depth information on the components that are highlighted in the assessment. The document is broken into sections based on the components described in the assessment. STTs can refer to this document to obtain examples or additional information that will help them to implement that particular component within their system of care. Click here to view the Readiness Assessment Tool or view the information as a PDF here.